If you are a working professional who requires a laptop on a day-to-day basis, you know that a good bag or backpack that fits your work environment is absolutely essential. Somewhere between 90-95% of my job is performed between my laptop, iPhone, and iPad Pro, so having a reliable bag that can hold all my gear and stand up to some wear and gear is absolutely essential. I have been through many such bags over the years, and have built up a solid collection that meet various needs. However, when it comes time to take your show on the road, the requirements change, and for those who travel often, they may be different enough to require a completely different approach. While I don’t fly more than once or twice a year for work, I do travel often by car and spend several nights a year in hotel rooms. While I used to just stick with my normal backpack and carry a rolling suitcase in addition to my mobile bag and way to much other stuff while on the road, I’ve recently been looking for ways to slim my travel setup down to make things more manageable on the road. During my research, I came across several products from eBags that had solid reviews on multiple sites and online stores. The pictures and video demos on their website are also VERY thorough, which gave me a good idea of what would work best for me. They were kind enough to let me take a look at their TLS Mother Lode Weekender Convertible Junior for review. Yeah. That’s a serious mouthful, but let me assure you right now that it’s a name well worth remembering. However, for the sake of brevity, I will refer to this bag as the Weekender Junior from here on out. I was very interested in finding a backpack that could carry both my laptop and iPad Pro and all their accessories, and also act as a basic suitcase. Something that I could use during my typical car trips for work, but would also double as a complete carry-on solution for the occasions when I do have to fly. After looking around eBags’ website, I settled on the Weekender Junior because I could tell it would carry a lot of clothes and extra gear, but was also well under the typical airline size requirement. The full-size Weekender (shown on the left) is right at the standard size for an airline carry-on, but many regional airlines have tighter requirements, so the Junior seemed like a safe bet for my needs. I’ll go ahead and say right off the bat that I’ve been very happy with this choice, as the Weekender Junior is a perfect size for me. Before I did any testing with luggage, I decided to see if the Weekender Junior could adequately stand in for my current work laptop backpack, which I have had for over five years now. I carry a lot of cables, adapters, and a few hand tools, as well as a wireless router and several other accessories in my bag on a daily basis. As such, I knew going into this test that the Weekender was not specifically designed to be a perfect fit for what I typically do. However, I wanted to see if it was flexible enough to handle the task at a basic level, or if it would be too big to use as a daily driver bag. I actually came away very impressed with how well the Weekender Junior faired. In fact, it worked out so well, that I have gone back to using it as my daily work bag for the time being. I have carried two bags around for several years, one being my work laptop backpack, and the other a smaller shoulder bag geared toward tablets and smaller devices. One of the big advantages of switching to the Weekender Junior full time is that it gets me down to a single bag that can hold everything. You can see more on this in the video review. As good as the Weekender Junior is, no product is perfect. It wasn’t a good fit for carrying any hand tools loose, since so much of the interior of the bag is what eBags refers to as “unstructured space.” That’s perfect for packing clothes, but not so much for small tools with sharp edges that could damage the bag’s lining if left loose while carrying it around. I used to carry an 11-in-1 Screwdriver, a pair of wire strippers, a Leatherman, and a small crescent wrench in a zippered side pouch in my old laptop backpack at all times. However, there are ways around this issue. Also, the water bottle pocket is also much more limited than what I am used to with my current bag. However, those were the only issues that I had. I recently took my family on a six day Spring Break vacation to Williamsburg, VA. That is a thirteen hour drive each way for a family of five (yes, we are crazy, but we did break the drive up a bit both ways), so even though we rented a minivan for extra space, we still needed to pack smart and conserve space where possible. I figured this was the perfect situation to test out the Weekender Junior, so I used it to carry my work laptop, charger, and mouse (which I unfortunately can never leave behind for that long), my iPad Pro with bluetooth keyboard and Apple Pencil, a smaller LG Android tablet, my mobile chargers and accessories, my toiletries, and enough clothes for the trip. I was even able to squeeze in the IFROGZ Bluetooth Headphones that I reviewed a month ago. The only other bag I carried was for my mirrorless camera and a couple of lenses. As you can tell from the description above, I crammed a LOT of clothes and gear into this bag, and I could definitely feel it when I picked it up. However, it handled it all like a champ. I never felt like I was putting too much of a strain on the straps, or that anything might break under the weight. I also really liked that I could get to my chargers, headphones, and iPad Pro using the easily accessible front pockets, while all of my clothes and other items remained safely tucked away in the interior of the bag. As above, check out the following video review to see how the Weekender Junior performs in different scenarios. The video also gives you a much better look at all of the pockets and features of the bag than I can describe. I also took the Weekemder Junior on a 4 day work car trip, as well as a recent 2 day work trip by air during the writing of this review. The performance on the car trip was as expected. I actually used the Weekemder Junior as more of a traditional suitcase, since I had to have all the gear in my work laptop bag on the job site with me. With just my iPad to hold this time, the Weekender Junior didn’t feel loaded down, even with 3 days worth of clothes inside. The Weekender Junior did even better on the flights that came on the next trip. I much prefer carrying a backpack through the airport, and even though I know you can bring a carry-on and a smaller bag on a flight, I wanted to see if I could get everything I needed into the Weekender Junior. I was able to pack my laptop, iPad, accessories, and 2 changes of clothes and still comfortably get through the airport and stow my bag in the airplane overheads. I even had one of the smaller regional jets that I referred to earlier on my last leg home, and the Weekender Junior JUST fit the smaller bins. I didn’t have to have my bag taken at the gate like many others on the flight did, so I was able to get straight off the plane and head home. That’s a good thing when your plane lands at 11:30 PM. Now that you’ve quite literally seen the ins and outs of the Weekender Junior, I want to highlight a few points that stood out to me. The design of this bag is just about perfect. The multiple carrying points and straps. 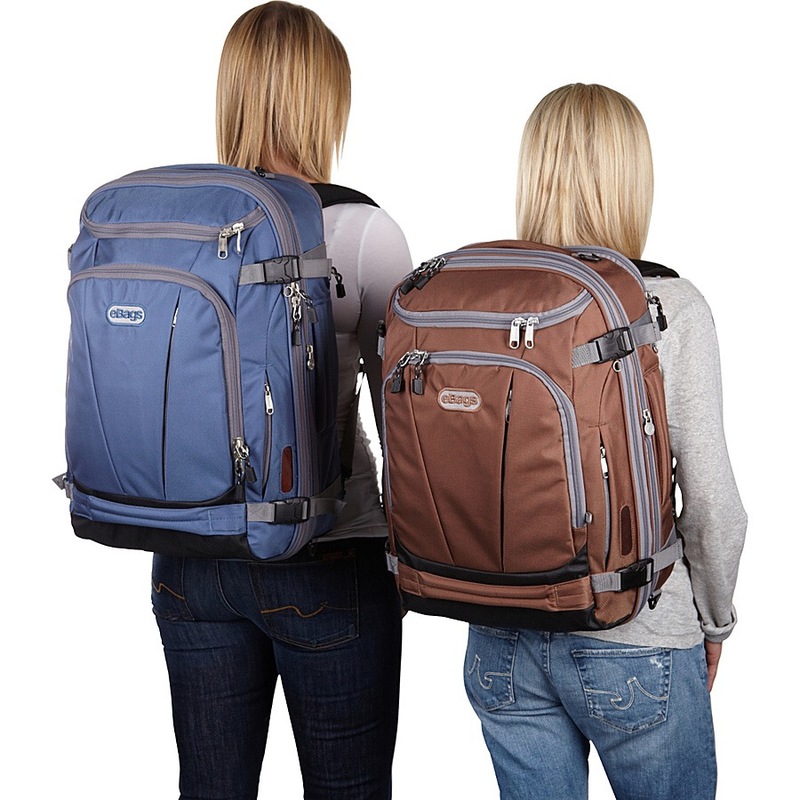 The retractable backpack straps that tuck away and zip up into the back section. The divider and adjustable security straps in the large compartment. The easily accessible front pockets and organizer area. It is obvious that a lot of thought went into the design. The only real complaint that I have with the Weekender Junior is the water bottle pocket. However, I understand why it is designed the way it is. This bag is really built with the needs of frequent flyers in mind. As such, is smart to make the bottle holder fold back into the bag for storage in an overhead bin, and there is no reason for it to be designed to hold anything more than a small plastic water bottle. I’ve never seen a bag that came with this many ways to carry or handle it. It has the backpack straps that can be tucked away, a suitcase handle, a handle on top, a handle near the bottom that can be used along with the one on top for lifting the bag into an overhead, and a shoulder strap with heavy duty connection points. No matter how you want to carry this bag, there is an included way to do it. I really appreciated how much the release zipper and restraining straps change the size, shape, and function of the bag. When I tried the Weekender Junior out at work, I kept the zipper zipped up and the straps tight. The bag held plenty of gear but kept its shallower shape and kept the load closer to my back, making it very comfortable to wear. Honestly speaking, even though Weekender Junior is heavier than my work laptop bag, the ergonomics make it feel better on my back with the same items loaded in it. When I took it on vacation, I unzipped the release zipper, let out the straps, and packed it to the gills. If you watch the video, you will definitely see a FL difference. I appreaciate that level of versitility. The front top pocket that can expand into the larger compartment below is really handy for storing things you want to be able to easily get to without having to dig through the bag. I liked that I could keep my laptop charger, Bluetooth mouse, and full size Bluetooth headphones in there where they were easy to get to. The front zippered pocket is also great for storing chargers, earbuds, and other small items that you also need to access quickly. The adjustable sling in the laptop compartment is definitely different. If given the choice, I would prefer a traditional padded pocket to store my laptop in, but I understand that this setup can provide a more snug fit during travel. It works, so this isn’t a major complaint. A positive of the laptop compartment is that it is HUGE. My 13″ Lenovo Yoga 2 is dwarfed in there. As you can see in the video, I was able to carry both my laptop and iPad Pro in a ZAGG Slimbook keyboard case in that compartment at the same time, as well. While I prefer keeping my iPad Pro separate in the front compartment, I was glad to find I could double up in the laptop compartment if I need the space up front for something else. The laptop compartment is also big enough to hold my Yoga in a laptop sleeve for a little extra padding. I did this when I took it on the flight. As I said in the video,I found that the secret sauce when using the Weekender Junior is eBags’ Packing Cubes. I noticed them in product demo video of the Weekender on the eBags website, and asked if I could give them a try for this review, as well. If you want to fully maximize the unstructured space in this bag, the cubes are the best way to do it. They honestly don’t seem like much when you first start loading them, but they will surprise you. They hold a lot more than you might think. I won’t beat around the bush. The eBags Weekender Junior is by far and away the best laptop bag I’ve ever used. The construction is high quality and polished, and indicates to me that durability shouldn’t be a problem long term. The design is second to none. Also, while the Weekender Junior is geared toward users who spend a lot of time on the road, I found it to be versatile enough to handle more typical, everyday use, as well. It will take good care of your laptop and iPad, and all their associated accessories, and a solid four days of clothes to boot. At $119.99, the Weekender Junior certainly isn’t a trivial purchase. 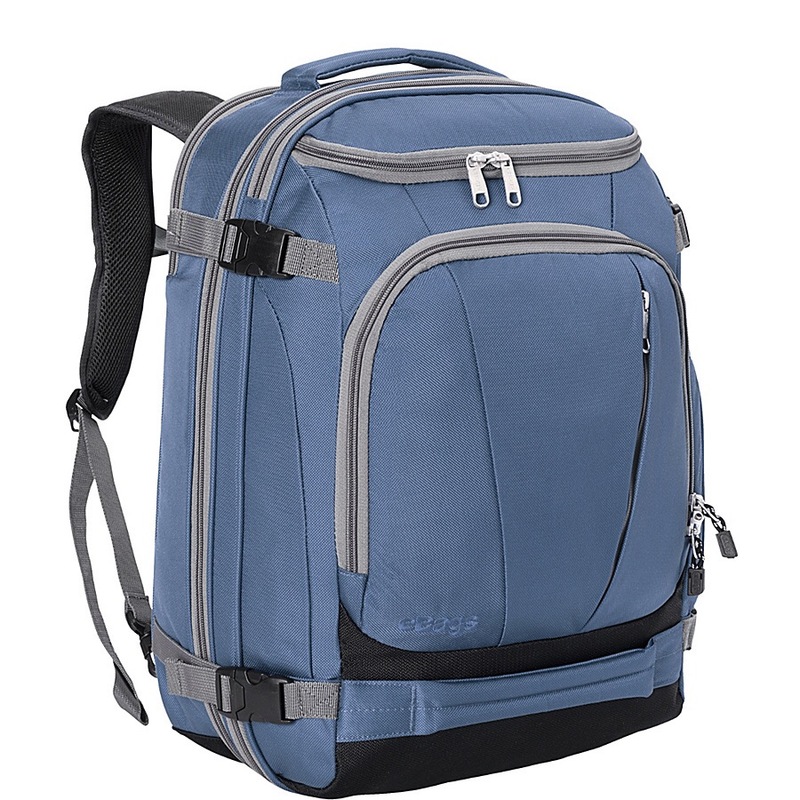 However, after my testing I would say that if you need a bag geared toward the rigors and needs of work travel, especially plane travel, this is a great fit and absolutely worth the price. The versatility and design are unmatched, and the construction should mean that you will be using it for a long, long time. There’s something to be said for investing in quality tools that are right for the job, and as far as I’m concerned, this bag is one such tool. The eBags TLS Mother Lode Weekender Convertible Junior is available from eBags for $119.99. It comes in Blue, Indigo, Eggplant, Green, Graphite, Red, and Turquoise. The TLS Mother Lode Weekender Convertible Junior was provided for review on iPad Insight by eBags. For further information regarding our site’s review policies, please see the “About” page. Near the end of the written review (the area where you note the pricing), you refer to it as the Weekender Pro. There is a very different ebags bag called the Weekender Professional (also a Pro Slim and Pro Slim Junior that might interest you as the WP is more geared towards air travel than the Slims). You should probably fix it to say TLS ML Wkndr Jr.
Have you thought of using a Grid-It system or some electronics pouches to help organize your lose odds and ends for work? Good catch, Deana. I kept falling into the habit of using Pro, rather than Junior and thought I had edited them all out. I actually chose berween the Weekender Professional Slim and the ML Weekender Junior. I’m very happy with my choice. I used to carry a separate mobile bag with my iPad and all my chargers and other things along with my work backpack. With the Weekender Junior I was able to consolidate all of that into one backpack. I use it everyday for work now. So far, I’ve just moved my hand tools over to my toolbag. I’ve had to carry that more lately for the jobs I’ve been doing, so it hasn’t been a problem. However, I have it on my to do list to find a small folding bag that I can keep an 11 in 1 Screwdriver, a pair of wire strippers, and a small crescent wrench in. Between these tools, a set of Ethernet crimpers, and a precision screwdriver, I can do about 75% of what I need.